Thanks to the kindness of my cousin to take me with him, my sister and I got to go see The Gaslight Anthem which are one of my favorite bands. I’m a little biased toward them, as getting to see was my very first concert, and it was a great time. However, I feel like I can say that I felt like they put on a very entertaining show. We went to see them at The Arena in Columbus, Ohio for their indoor concert. The staff there was great. When they saw that my sister had trouble seeing, halfway through the performance of The Gaslight Anthem, they upgraded us to the highest seats just so she could see. Words can’t express my gratitude at the kindness of the staff for doing that. I’ll probably never again get to experience seats like that again, so it definitely made it more memorable for me, as well as I felt free to finally rock out. My sister was just happy she could see, I think. If you ever end up there to see a concert, be nice to those people, they’re some great folk. We got there too late to see the Tim Barry,and I wasn’t very impressed by the second band. There was one song they played which was amazing that makes me think that they could be something someday, but right now, they just screamed immature. When The Gaslight Anthem finally got on stage, it felt like the real show had finally started. The Gaslight Anthem, in my opinion, despite being heavily influenced by Springsteen is truly one of the most innovative sounds I’ve heard in a long time. However, music is only part of a stage performance, there’s also the personality and effort that goes into the song. However, TGA has the performance part down pat. They’ve really grown from when I first saw them. In their first performance, while still amazing, were obviously nervous, and seemed shocked and surprised to be there. Here, the band appeared to have grown accustom to being in front of people, and really got into it. The way the lead singer got into “Even Cowgirls Get the Blues” and acting it out was a performance that was a treat to behold, and one of many treats. With each song, they had their own way of performing it in a different way then the song before, so their time on stage never got old. TGA also did covers of “Teenage Wasteland” and Tim Barry came out to do their cover of “The War”, both of them were damn fine covers. The other thing I really enjoy about these guys is that the lead singer loves his fans. When he was addressing us, I felt like he was glad that *I* came out to see him, as well as every other person in the audience. He had that way of expressing himself to the crowd, and yet making it personal. Oh Gaslight Anthem, you guys are great. I can’t wait until next time. 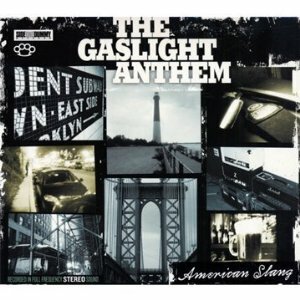 I actually saw the Gaslight Anthem about a week ago myself at the Osheaga festival. They were pretty good and I can understand what you mean when you say the band is very gracious for their fans. I felt that atmosphere there too when I saw them. I saw quite a lot of bands this day and they were some of the most memorable, but all they really did was sing their songs and say a few words. I would have liked if they really tried and work with their audience more as with some other bands I’ve seen.